The Blutronium Serial Bluetooth Adapter is our newest 2016 version adapter in our line of serial Bluetooth adapters. If you want the best and don't mind paying a bit extra for a product which is highly user-friendly, has improved reliability and additional features then this Serial to Bluetooth adapter is for you. The Blutronium Serial Bluetooth Adapter is designed by technicians and engineers who have been using this type of adapter for years; they have then taken their experience and paired it with the average user's suggestions and requirements. The result is an adapter which is easy to use even it has advanced features and has reliable performance in most applications. Most standard Serial Bluetooth Adapters require a physical serial port for the user to be able to configure the adapter's parameters. No modern computers have serial ports anymore, so the user would have to also buy a USB to Serial adapter to be able to configure the Bluetooth adapter's parameters. 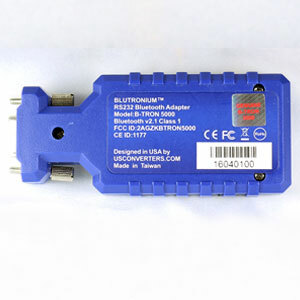 The Blutronium Serial Bluetooth Adapter can be configured easily over a PC's built-in Bluetooth or by the use of a USB Bluetooth dongle, it does not require a physical serial port or a USB to Serial adapter. 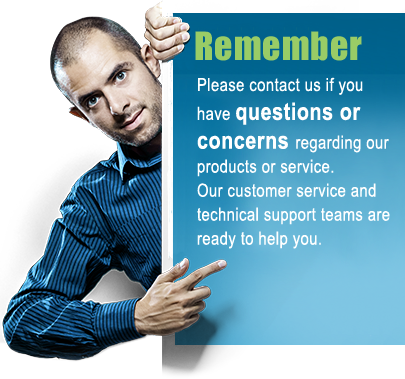 To configure the parameters most standard Serial Bluetooth adapters require 3rd party software to actually access and change the parameters. Many users experience problems with simply trying to connect to the adapter and configure the adapter this way. To access and change the Blutronium Serial Bluetooth Adapter's parameters, state-of-the-art software made particularly for the Blutronium has been created. This software makes it very easy to get an overview of all parameters and configure them as needed. 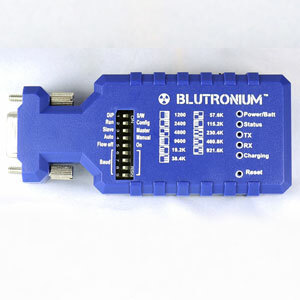 Another reason why the Blutronium adapter is considered very user friendly is because the most used settings such as baud rate, master/slave, flow control and auto/manual connection can be configured by DIP switches on the front of the adapter which means that in many cases the configuration software is not even needed to use the adapter. 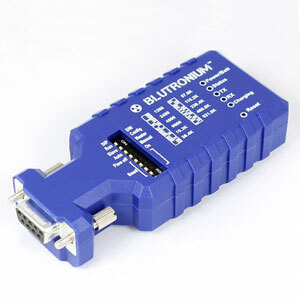 The Blutronium Serial Bluetooth Adapter is the only adapter on the market to offer all standard baud rates from 1200bps all the way up to 921,600bps, selectable by DIP switches and software, so regardless of your application the Blutronium adapter will always be compatible in regards to baud rates. 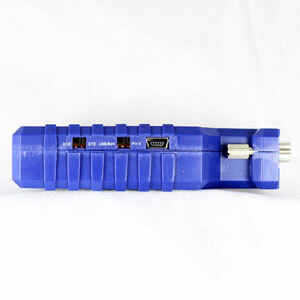 Working in the field without a power source or working at home connected to power makes no difference as the Blutronium adapter has a built-in rechargeable lithium battery. The battery has a minimum of 12 hours continous operation time which should be sufficient to get you through a work day. The battery can be re-charged by a standard USB port or standard 110VAC/5VDC mini USB power supply. Alternatively the adapter can be powered by a standard USB port or through the DB9 connector's pin 9. For ease of use and control the Blutronium adapter has multiple status indication LED lights on the front; these includes "Power/Batt" to monitor the power level and power source, "Status" to check the status of the Bluetooth connection, "TX" and "RX" to see if there is data activity on the transmit and receive lines and "Charging" to check if the battery is charging or if it is fully charged.